Elizabeth Morrison has inherited a small fortune, but a woman in 1840 doesn’t usually go it alone. With her sister Katherine missing and both parents gone to be with the Lord, she has no choice but to find her own way. Her journey takes her through an abandoned orchard, and she falls in love with derelict Sweet Grove – and its previous owner, Jonathan Bryant. No longer the owner of Sweet Grove but just a laborer, his bitterness hasn’t been sweetened by the fruit of his labour. Can Elizabeth carve her own journey and make a home for herself while her sister is still missing? Can Jonathan be brave enough to put the past behind him and find purpose again? Or will they both learn that life never goes in the direction you think, and love is always ready to take you on a different journey? This is the first in the Sweet Grove Beginnings series that explores just how the town of Sweet Grove was planted. 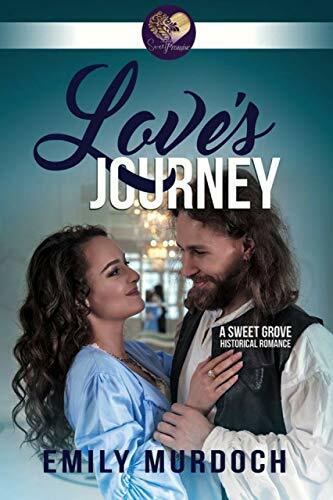 Love's Journey is a great introduction to Sweet Grove. When Elizabeth Morris buys the orchards on a bit of a whim - she just falls in love with the place the first time she sees it - she isn't quite prepared for the amount of work and learning she will need to tackle to keep the orchard running. But she is a determined woman. Determined to keep the orchard running and make a home for herself. Jonathan Bryant was born and raised on Sweet Grove and would like nothing more than to have it back in his family. Once he realizes that Elizabeth is in this for the long haul, he agrees to help her and teach her everything he knows about apples - which is quite a bit. Working so closely together, it's no surprise that these two hard-working people begin to fall in love. There is still some distrust lurking in the background and a near disaster at the orchard raise some hurdles they will need to overcome. There is also the issue of Elizabeth's missing sister, which lingers in the background throughout the story. Even though we learn the history along with Jonathan, it seems a bit incomplete, as does much of Elizabeth's history. It was glossed over in the beginning, and then when she opens up about it, it just doesn't have the emotional impact I thought it could have. There is a religious aspect to the story, and while it was very present, it was just a part of the story and the characters - which is how religion should be. This wasn't a "preachy" story in any way. I think I'd really enjoy taking another trip back to Sweet Grove and seeing how this budding community grows and flourishes.